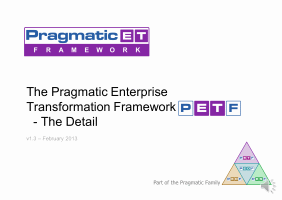 The Pragmatic Enterprise Family of Frameworks provides a coherent context for all frameworks related to Enterprises, defining common things that need to be consistent between them and providing an overarching structure for them all to be able to coexist and work together for the benefit of the whole of the Enterprise. 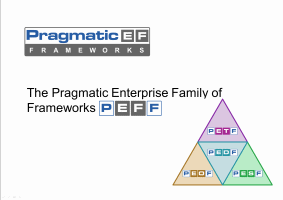 All “frameworks” operate within a domain, and within any domain there are many frameworks (Pragmatic is currently tracking over 700 “Frameworks”) with differing Shapes, Sizes, Scope, Completeness, Depth, Geography, Industry, Maturity, etc. Many “Frameworks” have grown organically and expanded their scope and areas of interest as they themselves have matured. How successful frameworks have been in morphing themselves into areas they were never designed to operate in is largely subjective, and opinion tends to be driven by allegiances and crusades. Because of this, there are overlaps, gaps, inconsistencies and clashes. In short, total confusion. 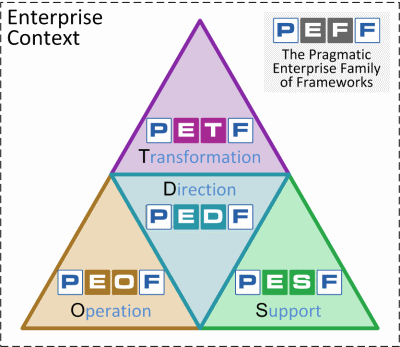 Consequently people have adopted these frameworks in a largely haphazard fashion, trying to optimise specific parts but never considering the whole. Perhaps starting in one area and then finding themselves being subtly pulled into other areas.